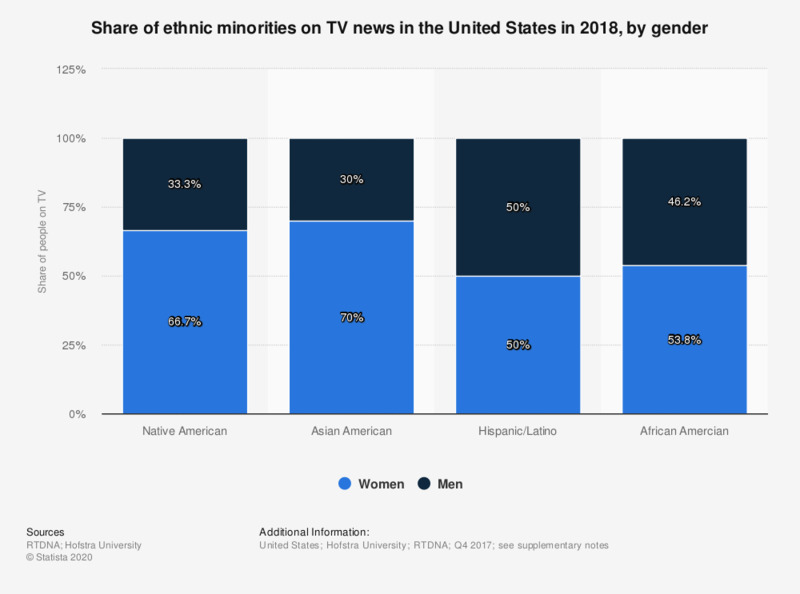 The statistic shows the distribution of ethnic minorities on TV news in the United States in 2018, by gender. According to the report, 53.8 percent of African Americans who were on TV news in the fourth quarter of 2017 were women. The survey was conducted among all 1,683 operating, non-satellite television stations and a random sample of 3,542 radio stations. Valid responses came from 1,333 television stations (79.2%) and 415 radio news directors and general managers representing 1,110 radio stations. Some data sets (e.g. the number of TV stations originating local news, getting it from others and women TV news directors) are based on a complete census and are not projected from a smaller sample. Everything On "Hispanic media in the U.S." in One Document: Edited and Divided into Handy Chapters. Including Detailed References. Minorities in Media in the U.S.
Statistics on "Minorities in Media in the U.S."
Are you more or less likely to watch a television show where the lead cast (i.e., main characters) are of the same race as you? Are there any news programs that you watch frequently? How much do you trust NBC?